This month’s tools include a utility for helping users manage their own passwords, the latest iteration of a venerable server configuration utility, and a handy copy utility that works on files of all sizes. Managing user accounts—especially passwords—at a large organization or one with a high turnover rate can be a colossal challenge. 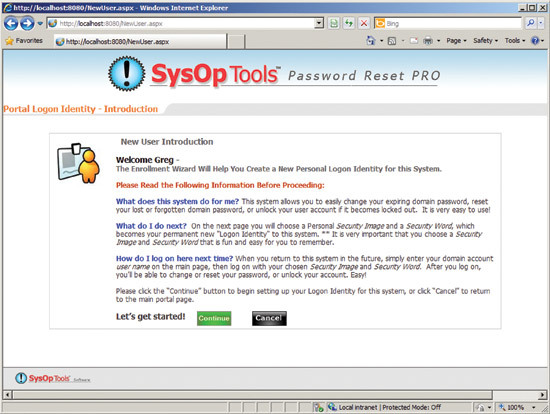 But there’s a tool out there designed specifically to help your users help themselves by doing their own password management—the SysOp Tools self-service Active Directory identity management tool Password Reset Pro. Password Reset Pro is a Web-based, self-service account management package that aims to help out your help desk by letting users do some basic account updating tasks on their own. You can install Password Reset Pro in a single server configuration or split the Web front end (the Web Portal) from the internal Active Directory service component (Master Service Server). That way, you separate the machine that talks to Active Directory from the one that serves the Web requests. The Web Portal component lets you define the port and IP address of the Master Service Server and the IIS bindings (IP addresses, SSL settings, host headers, ports and application pool) of the site. You can also add a custom title, header and footer to the site to personalize it with your organization’s disclaimer information or logo. The Master Service Server utility is where you set up your license, access, service configuration, notification and reporting information. The service caches your domain user accounts for faster access and allows you to also set the refresh frequency. You can set an explicit list of user accounts that will not have access to the Web portal, but . by default, all non-password-expiring and system accounts are denied access. You define the Web portal IP addresses—as well as the service port and credentials—at startup mode. You can also define the maximum allowed Web portal logon attempts and the profile “security word” complexity requirements, including length and banned words. The tool even lets you customize the text displayed for password requirements, help requests and contact information. Password Reset Pro gives you text logging, notification e-mails, audit reports and daily summary reports. You can see the audit reports in the Reporting Console, which also shows detailed user information for each of your managed domains. From the Web Portal you can see things like who’s been enrolled, which accounts are disabled and the event history. The utility also lets you “mass mail” those who have not yet enrolled or those you wish to send enroll reminders and usage details. You can export all these reports to Excel for reuse and analysis. A detailed, integrated help pane guides you through all components of this utility. It quickly shows you what you need to know with just enough detail. Once you have your system configured, the next step is to get your users enrolled by sending them an enrollment e-mail through the Reporting Console. After they receive the e-mail, they click the embedded link to the Web Portal and start the identity set up. The first screen shows the user what the site is and how it works. Once a user has completed the process by selecting an image and security word, they can check their profile to see how many days until their password expires, their account status, the last time they logged on to the portal and the last time they changed their password. They can also change their password, change their portal login details, submit a help request (which is useful for when their account has been disabled) or exit the system. This simple and easy to manage password Web portal will help your users self-manage with simple admin tasks. Password Reset Pro is priced per user and starts at $598 for a 100-user, single domain “permanent” license. There’s an annual licensing option available that starts at $1,148 for 400 users per year. **Keeping your servers optimally configured is one of the many things you can do to keep them running at peak performance. 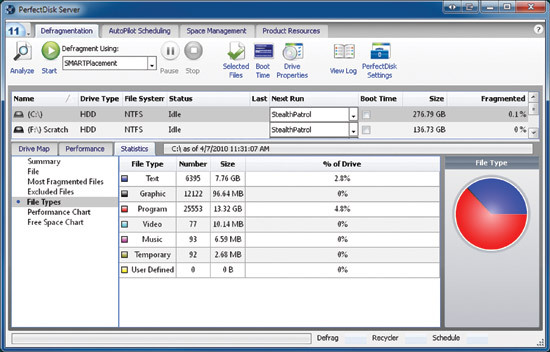 PerfectDisk 11 Server Edition from Raxco Software defragments your hard drives, solid-state drives and removable disks. It uses its Smart Placement algorithms to give your files optimal block positioning, depending on how you use your system. The Server edition of PerfectDisk is both RAID- and SAN-compatible and is certified to run on your Windows server OSes. PerfectDisk 11 is also aware of and can work with SQL Server and Exchange Systems to ensure that those disk arrays stay in good shape. If you want to work on your Exchange data store, take a look at the company’s Exchange-specific product. You can run your defragmentation on a custom schedule, on-demand (manually), or run StealthPatrol in the background, which will defragment during low utilization periods, which reduces the impact on users and applications. The defragmentation process can be kicked off when your users’ boot up,. or you can even defragment specific files (useful for large, rapidly changing files or a backup that is periodically copied to and removed from a system) and pick files you want to exclude (useful for legacy or tailored applications that get cranky when you try to move the underlying blocks). The GUI for PerfectDisk gives you a ton of information about your analyzed disks, including a graphical drive map and statistics detailing fragmentation, performance and usage. Besides defragmentation, PerfectDisk also has tools for duplicate file discovery, reporting and removal, which can be handy for your file servers when they run low on space. You can generate “Space Reports” that will show you usage by file type, create and modified date percentages (this allows you to see, for example, that Tuesdays are heavy file days for your server, so you would want to defragment on Wednesday), access statistics, and the top largest, oldest, and most recently modified files. There are a number of other nice sys admin-friendly tools and features as well. A single license for PerfectDisk 11 Server runs $99.99 for the full version and $50 for an upgrade. If you’re running a virtual machine server, you’ll want to take a look at the PefectDisk 11 vSphere and/or Hyper-V Bundles. These editions will give you integrated support for the virtualization server hosts, optimizing defragmentation schedules based upon guest system utilization (that is, your guest systems won’t be bogged down by the hosts background defragmentation) and run $499 for a full copy. If you plan on using PerfectDisk, you will definitely want to consider buying the $199 PerfectDisk 11 Enterprise Console, which gives you centralized administration of all your clients, including remote deployment, automated network defragmentation, reporting and an e-mail alert/notification system. As an IT Pro, you find yourself moving huge files from place to place. When you have to move files like this, it’s better to get them to their destinations as fast as possible. Other times, you may want to move it in a metered fashion so you don’t saturate your lines. One tool that has been around since 2004 to help you move or copy quickly is the free and open source FastCopy written by Shirouzu Hiroaki. This oldie-but-goody (last updated toward the end of 2009) 32-bit utility gives you a command line and simple GUI tool with a number of configuration options. It helps you move files fast by bypassing the OS cache and using Win32 API and C runtime without the MFC when copying. And if you want to see how this is done, it’s open source so you can take a look. FastCopy has a simple installer to embed Windows shell extensions for quick access, but you can also run it from a USB flash drive by copying the executable and help file to the drive, which is great for your desk-to-desk tools drive. To copy a file or directory you pick simply pick a source and destination and click Execute. If you want to tweak your copy, you can choose the buffer size to use, whether or not the application should try to copy at its full speed, to verify the result, estimate the copy time, choose to copy access control list files, and, you can even choose to copy alternate streams (ADS). You can also save and reuse different job settings as you go. Because this utility has a full-featured command-line option, it’s easy to schedule. You can also chain a post-processing command after the completion of the operation (or just have the system shutdown or play a sound). So if your normal file copy or move utility isn’t cutting it, give FastCopy a try. After all, it is free.